To Cite: Mohamadkhani A, Moafi S, Fazli H R, Mirzaei S, Sharafkhah M, et al. 8-Hydroxy-2'-Deoxyguanosin in Peripheral Leukocyte Associated With HBsAg in Patients with Chronic Hepatitis B, Jundishapur J Microbiol. 2017 ; 10(5):e42609. doi: 10.5812/jjm.42609. Background: Chronic hepatitis B (CHB), with accumulation of Hepatitis B surface Antigen (HBsAg) in hepatocytes, linked to the immune-mediated hepatic inflammation and induction of oxidative stress. 8-Hydroxyl-2'-deoxyguanosine (8-OHdG) is a useful biomarker for measuring the adverse effects of exogenous infectious agents in oxidative damage to DNA. Objectives: The current study aimed at investigating the possible oxidative adverse effects of HBsAg and systemic DNA damage in patients with CHB, and supporting the host-viral interaction in immune-mediated inflammatory. Methods: Thirty patients with CHB who had undergone liver biopsies for therapeutic purposes and 30 matched controls from a healthy population were randomly selected in the present study for assessment of 8-OHdG levels in peripheral blood leukocytes DNA by 32P-postlabeling analysis. 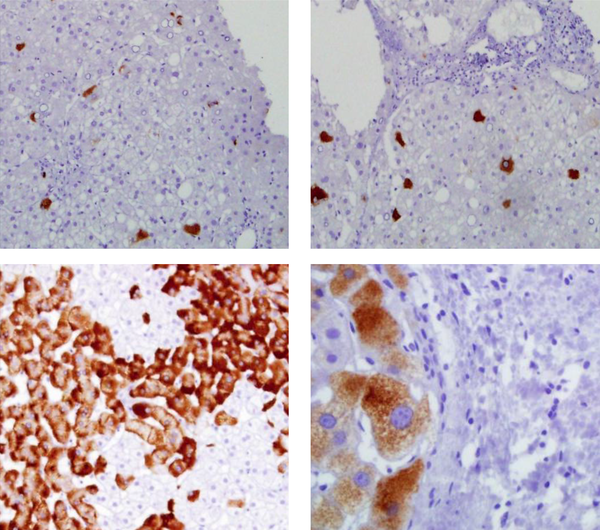 Expression of HBsAg in hepatocytes was evaluated immunohistochemically in liver biopsies of patients with CHB. The effect of 8-OHdG and 95% confidence interval (CI), adjusted by relevant confounders, were assessed on hepatitis B virus (HBV) infection. Results: Experimental investigation showed increased levels of DNA adduct 8-OHdG compared with healthy individuals (mean ± standard deviation, 1456 ± 1275 vs. 402 ± 271; P < 0.001). The logistic regression with continuous and dichotomous models revealed the strong impact of 8-OHdG on CHB infection (OR = 1.20; 95%CI: 1.01 - 1.44, P = 0.043) and (OR = 7.18; 95%CI: 1.32 - 39.02, P = 0.022). HBV DNA and hepatic expression of HBsAg had a borderline association with DNA adduct 8-OHdG (r = 0.35, P = 0.054 and r = 0.36, P = 0.05). Conclusions: The current study showed that the adduct of 8-OHdG in peripheral blood cells DNA increased in patients with CHB compared with healthy carriers and the pathophysiologic role of HBsAg in oxidative stress in patients with CHB. Nonetheless, the lack of efficient DNA repair enzymes activity as well as a proper diet with antioxidant agents in CHB need to be clarified in future studies. Chronic hepatitis B (CHB) is often a lifelong disease with increased risk of serious liver damage (1). Chronic infection is characterized by the persistence of hepatitis B surface antigen (HBsAg) synthesis. Higher production of HBsAg aggregates in the endoplasmic reticulum (ER) (main organelle in the synthesis, folding and trafficking of proteins) of hepatocytes that correlate with the cellular response known as ER stress (2, 3). Recent work provided information on HBsAg quantitation that improves the understanding of treatment response and natural history of CHB (3, 4). Envelope proteins of hepatitis B virus (HBV) often appear in the form of “ground-glass” hepatocyte shown in pre-S mutants or HBV genome integration in the host genome (3, 5, 6). Quantitation of HBsAg is considered as a prognostic and therapeutic biomarker in numerous studies. In addition, increasing levels of the reactive oxygen species (ROS) produced by granulocytes and macrophages related to the high titers of HBsAg are shown (7-9). Reactive oxygen species are ubiquitous in living aerobic organisms released from the mitochondrial respiratory chain or reaching from exogenous physical sources such as ionizing radiation, UV, and chemical compounds. These molecules directly interact with macromolecules and cause oxidative damage such as lipid peroxidation. Moreover, ROS causes structural alterations in DNA, ranging from base alterations and abasic sites (10, 11). 8-Hydroxyl-2’-deoxyguanosine (8-OHdG) is one of the main forms of free radical-induced oxidative lesions produced via oxidation at the C8 position of guanine for the transversion of GC to TA (12). Accumulation of this adduct induces the point mutations, and causes mispairing that is widely used as a biomarker for oxidative stress and carcinogenesis. 8-OHdG can also be traced in the number of recombination sites of cellular DNA with HBV DNA in adjusting to H2O2 (11-13). This DNA lesion is promutagenic as it leads to heritable genetic changes, and consequently increases malignant transformation (12). Although the presence of 8-OHdG in liver by virus-mediated ROS was extensively evaluated (12), no study focused on the endogenous level of DNA damage due to oxidative stress in human peripheral blood leukocytes in CHB until now. Therefore, the current study mainly aimed at evaluating the association between HBsAg with oxidative DNA damage and also the involvement of 8-OHdG in necroinflamation of patients with CHB. The current case-control study included 30 adult treatment-naïve patients and 30 healthy matched individuals as control from Digestive Disease Research Institute (DDRI), Hepatitis Clinic of Shariati Hospital, Tehran University of Medical Sciences, Tehran, Iran. Patients perinatally developed chronic infection as they had a strong history of familial HBV infection with the presence of HBsAg and were defined as chronic hepatitis B (CHB) group (14). Chronic hepatitis B in this study was referred to patients who had negative HBeAg, detectable HBV DNA, normal or elevated levels of alanine transaminase (ALT), and no evidence of liver disease cirrhosis or liver cancer. Liver biopsies were performed for therapeutic purposes in patients with CHB. Demographic data and blood samples were taken at the initial assessment, before liver biopsy, according to DDRI protocol (15). None of the patients established antiviral treatment prior to liver biopsy. The study was conducted according to the declaration of Helsinki. Written informed consent was obtained from all subjects. The present study was approved by the ethical committee of the DDRI, Tehran University of Medical Sciences (TUMS). Biochemical markers were measured using routine laboratory procedures. The presence of HBsAg, and absence of HBeAg, HCV, HDV, and HIV were determined by commercial assay kit EIA, (Dia.Pro diagnostic, Italy). The levels of HBV DNA in serum samples were quantified by LightCycler v 3.5 (Roche Applied Science, Mannheim, Germany) using the RealARTTM HBV LC PCR (QIAGEN, Hilden, Germany) with a detection limit of 10 IU/mL according to the manufacturer’s instructions. Liver biopsies from all patients were examined for histological activity index (HAI) rating necroinflammation with a grade of 0 to 18 and fibrosis stage, using the Ishak scoring system with a score of 0 to 6. Five-micrometer sections of liver biopsies were deparaffinized and stained with mouse anti-human monoclonal antibody against HBsAg (dilution 1/20, clone 3E7, Dako, Carpinteria, CA, USA) and standard avidin-biotin peroxidase method to evaluate the level and pattern of HBsAg expression in the hepatocytes. The intensity of immunohistochemical (IHC) staining was scored with a grading scale and reviewed by 2 pathologists. The HBsAg+ cells in the parenchymal area was quantified in 10 low power fields and the results were described by IHC score as a percentage of the overall parenchymal area: 0 = absent, +1 < 25%, +2 = 25% - 50%, +3 = 50% - 75%, and +4 > 75%. Blood specimens in the siliconized ethylenediaminetetraacetic acid (EDTA) glass tubes were centrifuged at 2000 g for 10 minutes and the buffy coats were separated manually. DNA was extracted using the Gentra Puregene kit according to the manufacturer’s recommendation (Qiagen, Alameda, CA, USA). DNA concentration and purity were determined by NanoDrop-1000 Spectrophotometer (Thermo Fisher Scientific Inc., Wilmington, DE) and coded DNA samples were subsequently stored at -80°C until laboratory analyses. The nuclease P1 32P-DNA post-labelling technique in bulky DNA from leukocytes was used to measure DNA adducts 8-OHdG. The lower detection limit of 8-OHdG by this method was 0.1 adducts per 109 normal nucleotides with validation in previous studies. The levels of DNA adduct 8-OHdG were stated as relative adduct labeling (RAL) values (13, 16). Normality assumption was assessed using the Shapiro-Wilk test and violated for the variables. The case and control groups were compared using non-parametric Mann-Whitney U test for continuous variables and Chi-square test for categorical variables. To assess the effect of 8-OHdG on HBV infection, logistic regression was conducted; therefore, 8-OHdG was considered as continuous and dichotomous (below the median and above the median) variables, both models were adjusted for age, gender, and ALT. The relationship between 8-OHdG and some markers in the patients with HBV infection were evaluated by the Spearman correlation coefficient. Statistical analysis was performed using the Stata version 12 (Stata Statistical Software: Release 12. College Station, TX: StataCorp LP). P values of less than 0.05 were considered statistically significant. The mean ± standard deviation (SD) of age were 38 ± 10 and 41 ± 12 years in the case and control groups, respectively; 73% (n = 22) of participants were male. Demographic characteristics and the clinical parameters of participants are summarized in Table 1. The mean ± SD of 8-OHdG was significantly higher in the case group, compared with the control group (1456 ± 1275 vs. 402 ± 271, P = 0.001). This significant difference continued when the quartiles for the 8-OHdG values were calculated (P < 0.001). The mean ± SD log10 HBV DNA in serum of patients with CHB was 3.39 ± 1.33 IU/mL. Abbreviations: ALT, alanine transaminase; CHB, chronic hepatitis B; 8-OHdG, 8-hydroxyl-2’-deoxyguanosine. The mean ± SD fibrosis stage and total HAI score in histological examination in the case group were 1.9 ± 1.5 and 4.9 ± 2.4, respectively, with significant correlations with the serum ALT levels (r = 0.48, P = 0.006 and r = 0.44, P = 0.01). In IHC staining, HBsAg displayed focal or diffuse cytoplasmic pattern (Figure 1) with a mean ± SD score of 1.8 ± 1.2 and a borderline association with serum HBV DNA (r = 0.33, P = 0.07). There were also trend correlations between serum level of HBV DNA and hepatic expression of HBsAg with DNA adduct 8-OHdG (r = 0.35, P = 0.054 and r = 0.36, P = 0.05). The 2nd row (× 200 and × 400) belongs to patients with higher expression of HBsAg. As it is shown in Table 1, the RAL values of 8-OHdG in leukocytes were significantly higher in patients with CHB. The odds ratios and P-values for the impact of 8-OHdG in CHB infection in continuous and dichotomous (below the median and above the median) models are outlined in Table 2. After adjusting for the age, gender, and ALT; multivariate regression analysis revealed that 8-OHdG was the robust variable related to the CHB (OR = 1.20; 95%CI: 1.01 - 1.44, P = 0.043) and (OR = 7.18; 95%CI: 1.32 - 39.02, P = 0.022) (Table 2). Abbreviations: ALT, alanine transaminase; HBV, hepatitis B virus; 8-OHdG, 8-hydroxyl-2'-deoxyguanosine. aMultivariable logistic regression models; HBV infection was considered as dependent and 8-OHdG as independent variables, and the 2 models were adjusted for age, gender, and ALT. The current study evaluated the 8-OHdG level of peripheral blood DNA in patients with CHB compared with the healthy individuals and its association with hepatic HBsAg. The results revealed that patients with CHB had higher levels of 8-OHdG than the healthy controls with significant relationship to hepatocytes HBsAg expression. Therefore, the current results indicated a link between HBsAg proteins and free radicals production in damaging the systemic DNA. The results conformed to previous reports that showed elevated levels of pre-S1 and pre-S2 proteins induce ER stress and ROS production (4, 5, 17). Likewise, it was shown that hepatitis B virus X protein (HBx) through mitochondrial membrane permeabilization increases ROS production (2, 18, 19). In physiological condition, ROS are produced in mitochondrial respiratory chain or through exogenous stimuli such as exposure to chemical or infectious particles (20). The immune system hires this approach as defense mechanism against pathogenic organism DNA by direct oxidative damage (20). However, the increase of ROS production, as a result of chronic HBV infection, and persistent activation of Kupffer cells can eventually develop the necroinflammatory liver disease and hepatocarcinogenesis (7, 8, 21). Prolonged production of ROS associated with an imbalance in antioxidant and repair systems of cellular defense mechanism results in formation of oxidative DNA lesions such as 8-OHdG (12, 22). In spite of the 8-OHdG evaluation in the liver tissue of patients with CHB in previous studies (12, 20, 23), there are few studies on the significance of 8-OHdG content in the peripheral leukocytes DNA in such patients (24). 8-OHdG content in immunohistochemical studies was strongly positive in human hepatocellular carcinoma (HCC) cancerous cells compared with non-cancerous cells, irrespective of the etiology of liver diseases (12, 23). Subsequent studies indicated that intrahepatic accumulation of 8-OHdG was associated with hepatocarcinogenesis (10, 25). Furthermore, oxidative DNA damage was involved in the pathophysiology of a series of human cancers as well as the aging process (10). The present study also found the association between accumulations of hepatic HBsAg with serum ALT and liver fibrosis that exhibited the correlation of HBsAg expression in the spread of hepatocytes with active liver disease, which was compatible with the previous studies (3). Despite all mentioned above, it should be considered that 8-OHdG in peripheral blood could belong to the content of both host and HBV genome; therefore, increased values of 8-OHdG in CHB indicate both host and HBV DNA damages. The direct association of HBV-DNA with 8-OHdG in the current study can explain the increasing frequency of HBV mutation when CHB faced host immune response. In summary, the current study showed that the adduct of 8-OHdG in peripheral blood cells DNA increased in patients with CHB compared with healthy carriers and the pathophysiologic role of HBsAg in oxidative stress in patients with CHB. Nonetheless, the lack of efficient DNA repair enzymes activity as well as a proper diet with antioxidant agents in CHB need to be clarified in future studies. Authors appreciate the participation of the patients in this research program. The present work was supported by digestive diseases research institute, Tehran University of Medical Sciences.